The ample meal over the holidays takes its toll: A burning sensation behind the breast bone points towards the gastroesophageal reflux disorder. But you don’t have to just take it as it is - there are several therapeutic options nowadays. 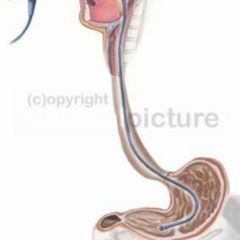 One way street for digestive liquids: The sphincter with valve function between stomach and esophagus normally prevents the body own hydrochloric acid goes its own ways up. If the stomach content flows back into the esophagus due to a weakening of this barrier, the sensitive esophageal mucosa is affected. The patients are tortured by a burning sensation which even might radiate all the way to the neck or the face. A reflux esophagitis might turn into an inflammation of the esophagus and in severe cases develops into a Barrett’s mucosa. This reconstruction of the cell structure is connected with an increased chance for cancer. “We can hardly estimate reliably how extensive and dangerous these damages are due to the severity and frequency of the symptoms”, reminds the gastroenterologist Professor Dr. Joachim Labenz, senior consultant at the Ev. Jung-Stilling-Krankenhaus, a hospital in Siegen/Germany. So gastroscopy is considered the method of first choice for diagnostics and control of success of therapy. Today the capsule endoscopy recently developed and ready to be marketed makes things more pleasant. Here the patient simply swallows a larger pill containing bundled technology. Specialists are able to control a miniature camera magnetically from the outside and thus receive high resolution images on the computer. According to a study, patients suffering from Barrett-esophagus profit from removal of the dangerous mucosa by high frequency currents. 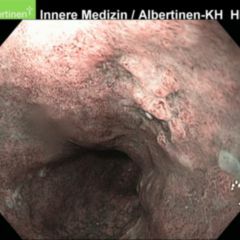 “In nearly 90 percent of the cases we succeeded to remove the intestinal metaplasia endoscopically”, emphasizes Labenz. 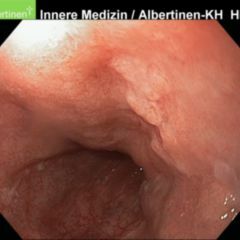 And already within the short period of 12 months of observation, significant differences were obvious: Only 1.2 percent of the patients with their mucosa actually removed, developed a carcinoma. Within the ‘placebo’-group “treated” with a machine not running, colleagues found a carcinoma after all in 9.3 percent of the patients. But this is not what has to happen – prophylaxis and therapy can prevent from secondary associated diseases. Reflux afflicted people first of all should reconsider their menu and the habits. Strongly spiced food, alcohol and nicotine are off-limits. Carbonated beverages actually were considered one of the reflux causing ‘bad guys’ but absolutely unjustly – a fact US researchers recently found out during assessment of the scientific literature. It is not possible to prove a relation between the GERD-symptoms (gastroesophageal reflux disease) and consuming bubbling beverages. Mainly the body weight has to be checked since every additional kilogram increases the pressure in the abdomen. You can summarize the results of the latest US-American study with the slogan: “less weight – less symptoms”. The participants had an average weight of 101 kg and lost an average of about 13 kg. Parallel to the weight reduction, the symptoms reduced as well. At the end of the observation period, a third of the participants were free of symptoms. Today numerous drugs are available for the systematic therapy. While antacids just neutralize respectively chemically bind the acid, H2-receptor antagonists and proton pump inhibitors (PPI) stop its production in the stomach by different mechanisms. But the Deutsche Gesellschaft für Verdauungs- und Stoffwechselerkrankungen (DGVS) (German society for digestion- and metabolic diseases) dissuades from H2-receptor antagonists since in about half of the cases they do not lead to a patient free of symptoms. Those have to be treated afterwards with PPI. In addition antacids and stomach protecting substances like alginate are not recommended for mono-therapy. The guidelines recommend accordingly starting with PPI, after a few weeks and decreasing symptoms it is indicated to reduce the dosage of the drug. PPI reduce acid resection and thus the acidity of the stomach – which is good for the cause. On the other hand this is related with a decreased resorption of calcium, vitamin D3, vitamin C, vitamin B12 and folic acid. A Canadian study took a closer look at the long-term effect of PPI therapy on bone density. They found an increased risk for osteoporosis fractures as well as for hip fractures. The result: Especially for older patients, a targeted supplement of bone-effective micronutricients should be taken into consideration. If all pharmaceutical else fails, there are still surgical measures. Here gastroenterologists sew parts of the stomach entrance. The trick: Sour juices cannot take their way to the esophagus any more. The endoscopic method developed at the Leipzig University has proved to be particularly gentle where a device named plicator is being used. And this surgery can be done ambulatory with a short anesthesia respectively sedation – the patient goes back home the very same day. At the end of 2008, a US cohort-study caused a riot. The data indicated an increased cardiovascular risk for GERD patients being treated with the anticoagulant Clopidogrel at the same time. Pharmacists point out as a potential explanation that both drugs are metabolized by the same enzyme, a cytochrome, and the quantity strongly depends on genetic patterns – accordingly there are people metabolizing both drugs either slowly or fast. And in the meantime, studies in 2009 and 2010 provide evidence that this interaction doesn’t have such a large relevance. Disillusionment in asthma therapy: For nearly two decades it was considered a fact that asthma might trigger or worsen a GERD. So what would be more obvious than to supply those patients totally with PPI. Studies did not come to a coherent result. Finnish scientists found a marginal advantage of PPI therapy. A Cochrane review, i. e. an overall review analyzing research results and studies, was not able to verify any gain – reason enough for US researchers to turn their attention to this topic. They initiated a randomized, placebo-controlled double blinded study with 412 asthma patients. Half of the participants were treated with PPI, the other with a placebo. Parallel to that, the participants wrote an asthma diary and the pH-level of the stomach juice was measured. The sobering result: Within the observation period of six months, there was no significant difference in asthma symptoms respectively reflux frequency. Thus the authors dissuade from an overly offensive application of PPI for asthma patients – but with according symptoms, their application does make sense with GERD patients. In order to regenerate the damaged sphincter in GERD cases, scientists also count on stem cell therapy. Physicians in Tuebingen/Germany developed a concept to use stem cells from the muscle tissue. Professor Dr. Alfred Königsrainer, medical director at the hospital for general-, visceral- and transplantation surgery in Tuebingen explains: “Basically we are talking about regenerating the sphincter of the esophagus by injecting stem- or precursor cells”. But it might take a while until this method gets established in standard therapy. So What is the final solution for GERD. I suffer from it on and off.